Dr. Crosby has more than 30 years of diverse research, teaching, science management and leadership endeavors. He has gained experience and expertise in developing, managing and conducting multi-disciplinary research and overseeing programs through his interactions, involvement and partnerships with numerous universities, national and international science and resource management agencies, programs and committees. Many of these endeavors focused on improving the synthesis, translation and transfer of science and technical information between research, public policy and stakeholder communities. He has played an active and significant role in directly leading national and international multi-disciplinary research programs, as well as developing national policy and administrative aspects for our country’s science programs. In May 2013, Dr. Crosby was appointed as President & CEO of Mote Marine Laboratory and Aquarium, an independent research institution that has been a leader in marine research for 60 years. Dr. Crosby had previously served for three years as Mote’s Senior Vice President for Research. He came to that position following appointments as Associate Vice President for Research and Economic Development at George Mason University, and Vice Chancellor for Research at the University of Hawai’i - Hilo. Prior to those appointments, he served in a federal Senior Executive Service position as Executive Director of the National Science Board - National Science Foundation. He came to the Board from the National Oceanic and Atmospheric Administration (NOAA) where he served as Senior Advisor for International Science Policy in the Under Secretary’s Office of International Affairs at NOAA. His previous positions in NOAA have been: Executive Director for the NOAA Science Advisory Board; National Research Coordinator for Ocean and Coastal Resource Management; and Chief Scientist for Sanctuaries and Reserves. Dr. Crosby also completed a special detail from NOAA to the U.S. Agency for International Development, where he served for two years as the Senior Science Advisor for Marine and Coastal Ecosystems. Prior to joining NOAA, he held numerous faculty positions with the Baruch Institute for Marine Biology and Coastal Research at the University of South Carolina, the Department of Marine Science at Coastal Carolina University, the Graduate Program at the University of Charleston, Salisbury State University and is currently Adjunct Professor of Marine Science at UH Hilo. He has also had previous science positions with the National Marine Fisheries Service, U.S. Army Corps of Engineers, and National Cancer Institute-NIH. He obtained an M.S. in Biology, with honors, from Old Dominion University and a Ph.D. in Marine-Estuarine-Environmental Sciences at the University of Maryland. He has developed successful research grants of more than $30M from NSF, NOAA, EPA, DOD, USAID, and others. Dr. Crosby has led major national and international, multi-discipline, multi-year research projects, such as a U.S. Man and the Biosphere Program project entitled "Ecological and socio-economic impacts of alternative access management strategies in marine and coastal protected areas"; the U.S., Israeli and Jordanian joint partnership project entitled “The Red Sea Marine Peace Park Cooperative Research, Monitoring and Management Program”; and the Hawai‘i State EPSCoR project entitled “Pacific High Island Evolutionary Biogeography: Impacts of Invasive Species, Anthropogenic Activity and Climate Change on Hawaiian Focal Species.” He is a member of the Natural Areas Association, Coastal Society, National Shellfisheries Association, Estuarine Research Federation, American Association for the Advancement of Science and is a Fellow of the Linnean Society of London. He also served 12 years on the Board of Governors and was past Chairman for the U.S.-Israeli Binational Science Foundation, is a Past-President for Sigma Xi-The Scientific Research Society, and is currently on the Board of Directors (Past-President) for the Association of Marine Laboratories of the Caribbean, Board of Directors (Past-President) for the Pacific Congress on Marine Science and Technology, and the Institute for Venture Science Board of Advisors. Dr. Crosby serves as a reviewer and panelist for numerous scientific journals and national and international science panels and advisory committees. He has published more than 50 articles in the Marine Ecology Progress Series, Journal of Shellfish Research, Journal of Experimental Marine Biology and Ecology, Diseases of Aquatic Organisms, Marine Biology, Marine Pollution Bulletin, Limnology and Oceanography, Ocean and Coastal Management, Natural Areas Journal, Coral Reefs, Oceanography, Aquatic Conservation, various technical memoranda series, and has edited several books and manuals dealing with marine protected areas and coral reefs. 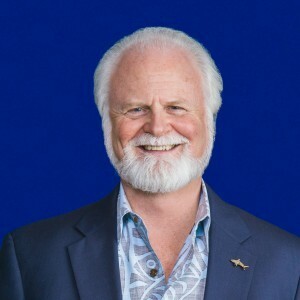 In 2009, he also co-Chaired the development of a Hawai’i Statewide Science and Technology Strategic Plan as requested by the Hawai’i State Legislature. eds. Science Publishers Inc., Enfield, NH, USA. p. 244-266. Science & Ocean Management, M.H. Nordquist, R. Long, T.H. Heidar and J. Norton Moore, eds. Martinus Nijhoff Publishers, Leiden/Boston. p. 271-293. Ecosystems. John Wiley & Sons Interscience, West Sussex, UK. 141 pp. dynamics of an obligate corallivore butterflyfish. Aquatic Conserv: Mar. Freshw. Ecosyst. 15:13-25. Workshop: Butterflyfish (Family Chaetodontidae) Research and Monitoring. Aquatic Conserv: Mar. of Gulf of Aqaba benthic habitat in Jordan Aquatic Conserv: Mar. Freshw. Ecosyst. 15:27-43.
the Northern Persian Gulf, I.R. Iran. Aquatic Conserv: Mar. Freshw. Ecosyst. 15:91-99. Leadership in Discovery and Innovation? pp. 21-27. IN: Kelly, T.K, W.P. Butz, S. Carroll, D.M. Decision-making. Science and Technology Policy Institute, RAND Corporation, Arlington, VA.
6 issues and ideological clashes around marine protected areas. Aquatic Conserv: Mar. Freshw. determination of coral reef bottom cover from multispectral fluorescence laser line scan imagery. Proc. Gulf Carib. Fish Inst. 72-83. Bohnsack, J.A., B. Causey, M.P. Crosby, R.B. Griffis, M.A. Hixon, T.F. Hourigan, K.H. Koltes, J.E. Maragos, A. Simons, and J.T. Tilmant. 2002. A rationale for minimum 20-30% no-take protection. Proceedings of the 9th International Coral Reef Symposium. 615-620.
anthropogenic threats to coral reefs in Pacific Island Nations. Ocean Coastl. Manag. 45:121-137. Crosby, M.P., B. Al-Bashir, M. Badran, S. Dweiri,, R. Ortal, M. Ottolenghi, A. Perevolotsky. 2002. Yangmingshan National Park, Taipei, Taiwan. p. 233-248.
and the Biosphere Program. Washington, DC. 164 pp. Natural Resources, Hawaii State Government. Reese, E.S. and M.P. Crosby.1999. The use of indicator species for coral reef monitoring. pp. 121-128. Department of Land and Natural Resources, Hawaii State Government. Silver Spring, MD. [on-line (http://oceanservice.noaa.gov/websites/retiredsites/sotc_pdf/CRF.PDF)]. the public in marine and coastal protected areas. pp. 10-24. IN: Crosby, M.P., D. Laffoley, C.
Silver Spring, MD, USA. 247 pp. pp. (accompanied by a twenty-minute video). and Atmospheric Administration, Silver Spring, MD, USA. 80 pp. Threatened Relationship. Oceanography 9: 83-99.
to the Working Group of the South Florida Ecosystem Restoration Task Force. 487 pp. management priorities. East West Center, Honolulu, HI. Species in the United States and Coastal Waters. pp. 428-431. IN: E.T. LaRoe, G.S. Farris, C.E. Nat. Biol. Ser., Wash., D.C.
Reserves, with examples of fisheries-focused studies. Natural Areas Journal 15:12-20. Crosby, M. P., S.F. Drake, C.M. Eakin, N.B. Fanning, A. Paterson, P.R. Taylor and J. Wilson. 1995. The United States Coral Reef Initiative: an overview of the first steps. Coral Reefs 13: 249-251. Nature Conservation Agency, Canberra, Australia. Oceanic and Atmospheric Administration, Washington, D.C. pp. 69-78. G.I. Scott, M.H. Fulton, M.P. Crosby, G.T. Chandler, T.F. Bidleman, P. B. Key, J.W. Daugomah, C.J. (SAY). Mar. Ecol. Prog. Ser. 79:89-98.
situ growth rates of a naturally settled bivalve. J. Shellfish Res. 10:95-103.
population structure, density and condition of endemic intertidal oyster populations. Environ. Test. Ser. rep./ N.C. Port Authority. 11 pp. marinus (and an absence of Haplosporidium spp.) in oysters from a South Carolina salt marsh. Diseases Aquat. Org . 9:149-155.
with a suggested standard method. J. Shellfish Res. 9:233-238.
anthropogenic inputs on bivalves: Current trends and suggestions for the future. J. Shellfish Res. carbon budget of the oyster, Crassostrea virginica (Gmelin). Mar. Biol. 100:343-352.
anthropogenic perturbations to shellfish growing waters. J. Shellfish Res. 7:199-200.
using direct counts and 3H-Thymidine incorporation. J. Exp. Mar. Biol. Ecol. 108:93-97. Crosby, M.P. 1986. Utilization of detrital complexes by the oyster Crassostrea virginica (Gmelin). Ph.D. dissertation, University of Maryland. 164 pp. detritivores. J. Exp. Mar. Biol. Ecol. 93:273-283.
dimethylsulfate. J. Exp. Mar. Biol. Ecol 67:185-198.
of detrital material by Palaemonetes pugio, using 14C radiolabeling methods. Proc. of the 59th Meet. of the VA Acad. of Science. He is a member of the Natural Areas Association, Coastal Society, National Shellfisheries Association, Estuarine Research Federation, American Association for the Advancement of Science and is a Fellow of the Royal Linnean Society of London. He is also currently on the Board of Directors and Immediate Past President for the Association of Marine Laboratories of the Caribbean, on the Board of Directors and Immediate Past President for the Pacific Congress on Marine Science and Technology, Past-President for Sigma Xi-The Scientific Research Society, and past Chairman and 12-year Governor for the U.S.-Israeli Binational Science Foundation.